The nostalgic 1970s T-Bucket plans in this eBook include some unique T-Bucket construction tips and tricks you won’t find anywhere else, including how to build a quarter-elliptic leaf spring rear suspension. They’re not meant to be pretty, but these practical 1970s T-Bucket plans can save you loads of time and needless frustration. Plus, you get 35+ pages packed with illustrations and templates you can use in your own T-Bucket build. The same decade that brought us disco, the pet rock and leisure suits also introduced some cool 1970s T-Bucket plans you’ll want to have not only for ideas for your own build but also some helpful T-Bucket construction tips and tricks. 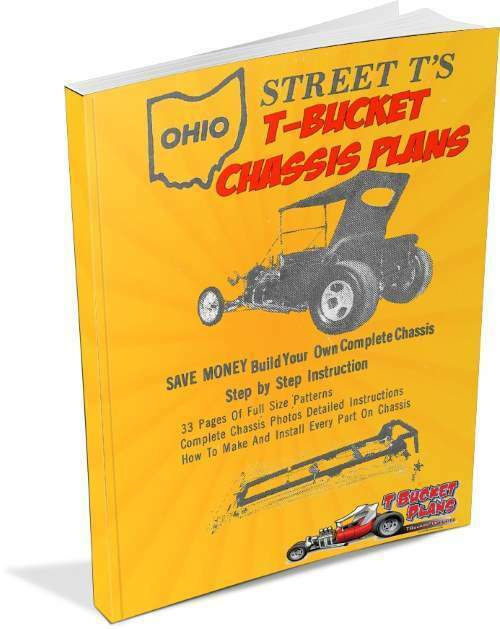 In the 1970s T-Buckets as a hot rod trend were booming and to the meet the growing need for more T-Bucket building information the Ohio Street T’s T-Bucket Plans were introduced. Lots to learn from these 1970s T-Bucket plans. Download these fun, informative PDF eBook plans today! These 1970s T-Bucket plans by a company called “Ohio Street T’s” first came on the hot rod scene back in 1976 through a few small space ads in Rod Action magazine. This was about one year after the California Custom Roadsters (CCR) T-Bucket Chassis Plans were introduced. Intended to be a budget T-Bucket plan set, compared to CCR’s more detailed plans, the Ohio Street T’s plans were peppered with misspellings and typos. But we’ve cleaned up most of that. After all, they were produced by a 1970s T-Bucket builder, not a writer. The Akron-based Ohio Street T’s ceased to exist many years ago. We’re making these cleaned up 1970s T-Buckets plans available to T-Bucket builders today because they contain some plan information you just won’t find anywhere else. And you’ll find lots more to like, too. Just click on the “Add to Cart” button to securely purchase these informative and interesting 1970s T-Bucket plans through PayPal and then immediately download loads of great T-Bucket hot rod “how to” information.